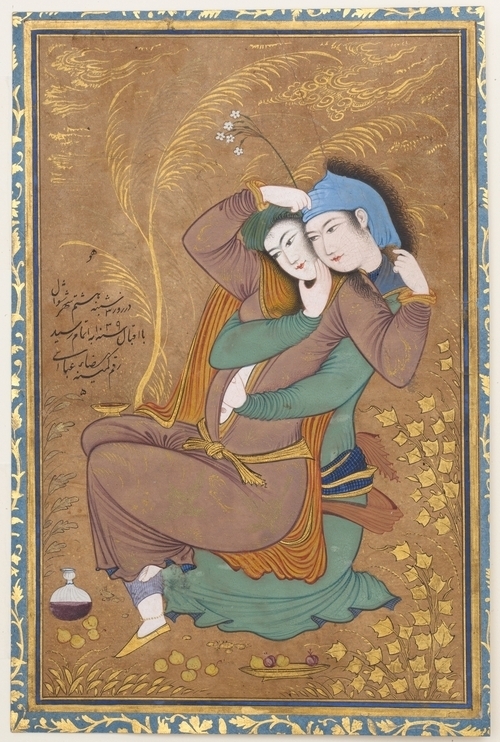 This is a renowned Persian painting called Two Lovers, painted by a well-known Persian miniaturist (Wiki) Reza Abbasi (Wiki), and dated A.H. 1039/ A.D. 1630. The current location of this painting is Metropolitan Museum of Art in New York City (see here, here and the Museum’s Bulletin: here). The ambiguity of this painting is really interesting. Are they a gay or straight couple? There are different opinions regarding the sexual orientations of these two lovers. Some argue that they are both male. I argue that they are a heterosexual couple. I believe that the one in the Brown attire is female, it could be understood from the feminine shape of her body—one of her breasts appears between their hands, and her wide female thigh and hip are pretty obvious too. Spain is still very much a Catholic stronghold. According to a study by the Spanish Center of Sociological Research over 70% of Spaniards self-identify as Catholics (Wikipedia: Religion in Spain).